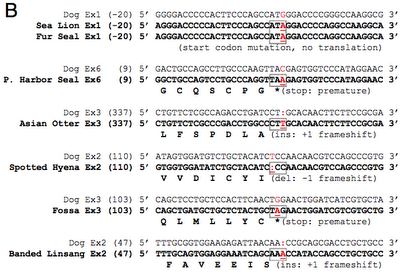 Pseudogenes are genes that used to have a function, but no longer do. If a gene contributes to an important function for the organism, offspring with deleterious mutations that ruin the gene will have lower fitness, and as a result won't have as many offspring, if any at all. That mutated gene will likely not go to fixation (become prominent in the population). On the other hand, if the gene used to have a function, but no longer don't, then mutations affecting the gene won't be deleterious. Mutations that turn off its expression (so the protein the gene codes for is no longer produced), and mutations that mess up the amino-acid sequence of the protein (so the protein can't carry out the previous function), won't be detrimental to the individual that has those mutations if the individual no longer needs that function. As a result, those mutations can go to fixation either by genetic drift (i.e., at random), or can even be selected for (e.g., when there is a cost to producing the proteins). However, examples where pseudogenization is coupled to function is rare. A new study published in PNAS links genes that code for taste receptors to specific dietary changes in carnivorous mammals. Basically, animals that do not eat sweets don't have receptors for sweetness (e.g., cats), and animals that swallows their food whole have no receptors for umami (e.g., sea lions, dolphins). Mutations causing loss of the sweet-taste receptor gene are in red. 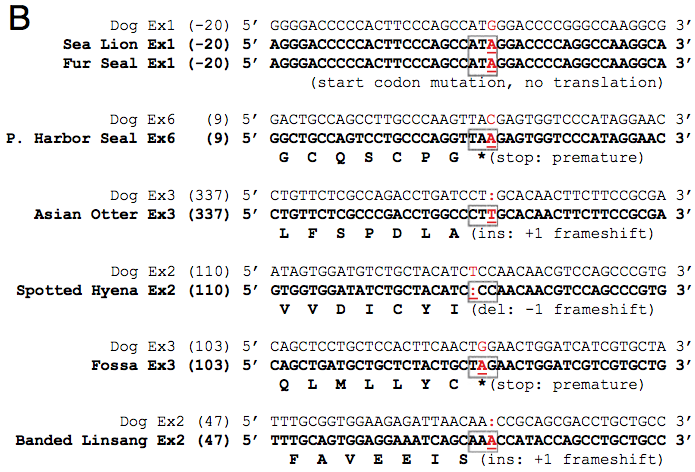 The exons (DNA coding for a protein) are intact for dog, which can taste sweet just fine, compared to the exons for various other carnivores which cannot taste sweet, the poor souls. Examples of what the mutations actually do. Looks like they typically cause frameshifts, which makes the rest of the gene nonsense, and introduces stop codons, which causes transcription to stop prematurely. 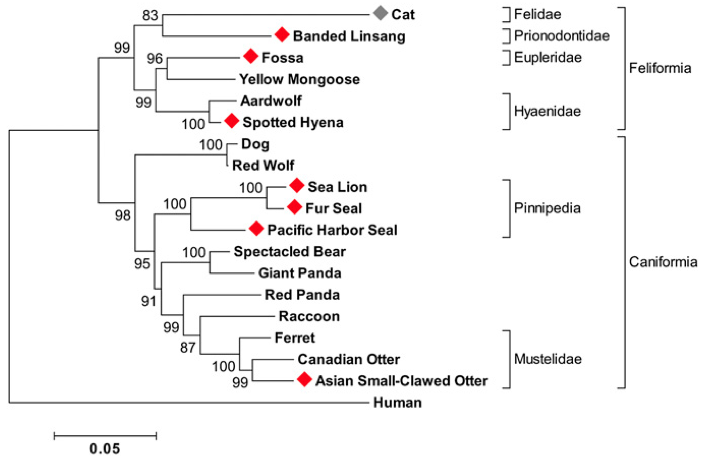 The first one, with Sea and Fur Seals, shows a mutation that messes up the promoter region of the gene, thereby ruining gene expression. Phylogenetic tree showing loss (diamonds) of Tas1R2, one of the genes coding for a protein that enables animals to taste sweet. In this way, several species have lost taste-receptors, and they have done so independently. The Fossa of Madagascar™ have lost the gene for the sweet-taste, but their most close relative examined, the Yellow Mongoose, have not. The red diamonds in the this phylogenetic tree indicates in which the gene for sweet taste has become a pesudogene. The results strongly suggest that loss of the gene has occurred multiple times, rather than once in a common ancestor. 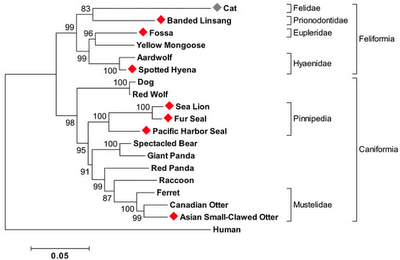 Measuring the strength of selection along these branches, the authors found that the ratio of non-synonymous to synonymous substitutions, dN/dS (aka ω) is considerably lower for the species that can still taste sweet, compared to those that can't. An ω lower than one means that mutations that change the amino acid sequence aren't tolerated, while those that don't (the synonymous mutations) are. Recently, sweet, umami, and bitter taste receptors have been implicated in several extraoral functions (36). Pseudogenization of Tas1r receptor genes in dolphins and sea lions and Tas2r receptor genes in dolphin indicates that these receptors cannot be involved in extraoral (e.g., gut, pancreas) chemosensation (36) in these species. Thus, to the extent that these extraoral taste receptors are functionally significant in rodents and humans, these functions must have been assumed by other mechanisms in the species we have identified here with pseudogenized receptors. What these other mechanisms are remains to be determined, and further assessment of the relationships among taste receptor structure, dietary choice, and the associated metabolic pathways will lead to a better understanding of the evolution of diet and food choice as well as their mechanisms. 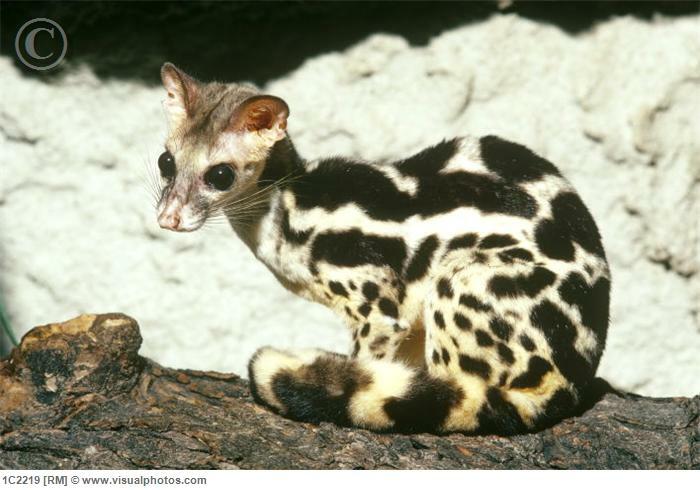 One of the species in the order Carnivora is the Banded Linsang, which lives in tropical forests of Thailand, Malaysia, Borneo, and Java. I include a picture of it here just because I have never seen this creature before, and because it is super adorable. It is a close relative of cats, and cannot taste sweet.